The Mowbraytown research action group was formed in 2007 as a result of discussions between members of the local Neighbourhood Watch. The research group is dedicated to preserving the colourful history of both the Mowbraytown and Mowbraypark areas. They are actively seeking assistance in locating both historic photographs and stories relating to this area. You can contact the group by calling Justeen Tel (07) 33913002. The original Mowbraytown precinct is bounded within Laidlaw Pde to Mowbray Terrace and Wellington Rd to Oakland Pde. The Groups goal is to have this part of East Brisbane officially renamed Mowbraytown or Mowbraypark. 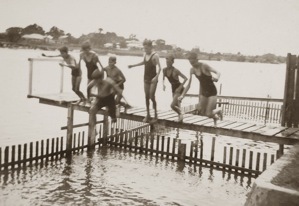 These photos are from the early 1930's in the Mowbraytown / East Brisbane area showing children having swimming lessons, at Samuel Learmonth's home in Laidlaw Parade, near Mowbray Park. 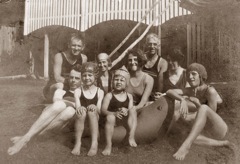 Costing a shilling a time, the location was a favourite meeting place for the young on warm summer days. The seated group photo is of Samuel and his family in the backyard. To protect against shark attacks a wooden fence was built into the river to create a safety zone. Jetties were part of all riverside homes, fish were in abundance at that time and caught easily from the clean river. Mr Peter Cambridge now in his 80th year recalls his childhood visits to the swimming lessons and tells how some of his mates avoided the cost of the lessons by just going to "watch"
He also tells of his many successful fishing expeditions in the same area with the resultant catches given to The "Berilda Private Hospital in Laidlaw Parade for the patients & staff. Fishing off the Jetties was then common site, and we suspect a young Peter Cambridge may have wagged it once or twice to indulge in his favourite pastime. 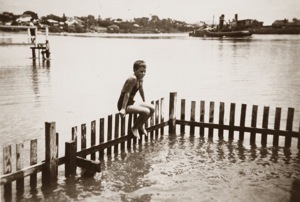 That stretch of the Brisbane river near Laidlaw Parade and Mowbray Park was in those times a water playground for all who lived in the area. 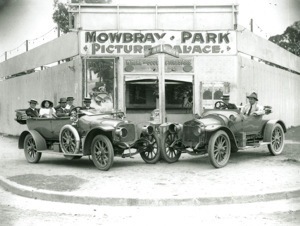 Memories of the Mowbray Park Picture Palace came flooding back to readers when the historic picture of the venue was published recently. The second published story was as follows. Several of the recollections were from Thelma Stoddart whose father Sam Learmonth was the sound technician. This wonderful photo was taken in the early days before the building was renovated and roofed- imagine the rainy season and watching a film in a theatre full of umbrellas! One resident remembered when the metal roof was installed, the sound of rain was very loud. Another remembered the canvas double chairs were very comfortable they were in the centre and there were fold up ones at the sides. The cars in the foreground were advertising the Movie to be shown called the "Kissing Cup's Race"(1931). The English Actress Madeleine Carroll had the lead role and she had acted in a long list of movies some of which included “School for Scandal”, “Spellbound”, and the Hitchcock thriller “39 steps"
This is the Mowbray Park Picture Palace in the early days, before the building was renovated and roofed. Imagine watching a film in a theatre full of umbrellas. But then, heavy rain on the tin roof that was installed often drowned out the soundtrack.